Fifty years ago, Saul Bellow's third novel — a rollicking picaresque with a bold young Chicago hero — propelled him into the front ranks of American writers. Since then, critics have come to admire the book even more, with some calling it the greatest American novel since World War II. The chanterelle-laced risotto had been spooned out to each dinner guest and the glasses of red wine poured. "To our host," said Janis Bellow, raising her glass. Nonsense, replied Keith Botsford with a modest wave of his hand. He rose up to his full height and, with playful pomposity and an Italian spin, offered a toast of his own: "To the 50th birthday of our distinguished friend Augusto Marzo." To the 50th anniversary of the publication of The Adventures of Augie March, that is. 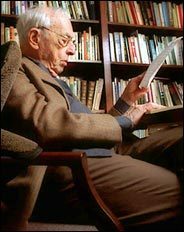 Its author, the 87-year-old Chicago-reared Nobel laureate Saul Bellow, raised his glass and drank appreciatively with the others. A literary friend was in town from England, and Botsford — who had first met Bellow on the evening of the book's publication and currently teaches a course with him at Boston University — was having the Bellows and a handful of other friends to dinner at his Boston home. The Bellows' three-year-old daughter, Rosie, slept upstairs while the adults ate, drank, and talked, mostly about food and literature. Bellow's own work was barely discussed beyond Botsford's toast. At one point, though, someone asked Bellow about an incident recounted by James Atlas in Bellow, his 2000 biography of the writer. 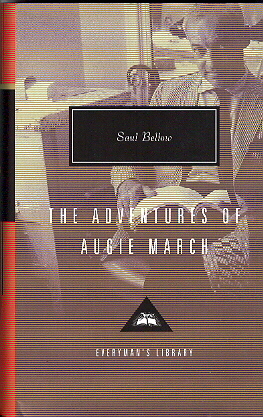 According to Atlas, the sight of water flowing down a street in Paris had inspired Bellow to cast aside the restrained style of his first two books and let his writing run freely — in a "cascade of prose," as Atlas puts it — in The Adventures of Augie March. Bellow gave a tiny grimace, leaned over the table, and shook his head slightly in mild irritation. What Atlas was referring to, Bellow explained, is the Parisian custom of opening the hydrants each morning to clean out the gutters. That's the trickling water Atlas was talking about. But you do agree, another guest persisted, that your writing voice changed remarkably in Augie March? And why did that voice not appear until then? "I hadn't found it yet," Bellow replied. So much for literary epiphanies. Talk that evening turned to other matters, and Bellow held up his end of the conversation by peppering it with bons mots. A couple of times he even broke into song, calling up from memory three verses of the old Cab Calloway hit "Minnie the Moocher." Ultimately, he and his family left Botsford's dinner party ahead of the others. Janis had a class to teach early the next morning at Tufts, and father, mother, and daughter all needed to get home to bed. Bellow stood in the doorway in his blue-green wide-wale corduroys, winter jacket, and a Chicago Bears cap bidding Botsford and the other guests adieu. As he shook Bellow's hand goodnight, one of the others, also a transplanted Chicagoan, couldn't resist asking Bellow if he missed their hometown. "No," Bellow replied with surprising emphasis. "I don't miss Chicago at all." Then he turned and followed his wife and still-sleeping daughter to their car. Bellow may have little interest in reminiscing about his former hometown or talking about The Adventures of Augie March, but there are others out there who continue championing that rollicking tale of an optimistic Chicago street kid hustling his way to manhood in Depression- and World War II-era America. And why shouldn't they? 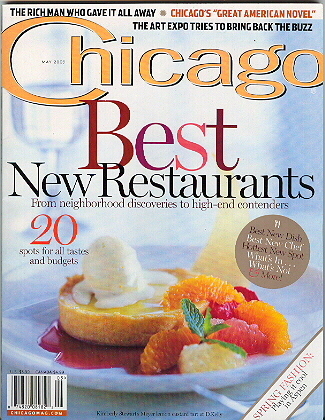 This was the book, after all, in which Bellow discovered the voice that would earn him his Nobel Prize in literature in 1976, a voice that is evident from the novel's famous opening sentence: "I am an American, Chicago born — Chicago, that somber city — and go at things as I have taught myself, free-style, and will make the record in my own way ... ."
"There is probably no more definitive statement about [Augie March] than Bellow's own, that he discovered his 'powers' in writing that book," says Scott Turow, another novelist who has used his life in Chicago as fictional fodder. "Bellow broke out of the straitjacketed prose and dust-dry realism of his earlier novels and invented that combustible mix of high-flown ideas expressed in a low argot that characterized his writing thereafter." Bellow’s two earlier novels, Dangling Man (1944) and The Victim (1947), had been smart, self-conscious works of art in the tradition of masters such as Gustave Flaubert and Henry James. Though praised by critics, they had sold fewer than 4,000 copies between them. That changed dramatically with Augie March. It never quite made the bestseller lists — today, the most widely remembered bestseller from 1953 is James Jones’s From Here to Eternity — but it was an alternate selection of the Book-of-the-Month Club and sold 30,000 copies in hardcover early on. Over the last three years, it has averaged 5,800 paperback sales annually for Penguin, and Viking, its original publisher (and the publisher of most of Bellow’s novels since), plans to bring out a hardcover edition of Augie March this year on September 18th, the book’s golden anniversary. By the time Bellow’s third novel was first published, it had already been excerpted widely, in magazines ranging in size and tone from The New Yorker to Partisan Review to Harper’s Bazaar. The New York Times Book Review gave it a mostly positive review on its front page on September 20, 1953, and ran an accompanying short interview with Bellow; Time and Newsweek each reviewed it that same week; and reviewers as distinguished as Robert Penn Warren (in The New Republic), Delmore Schwartz (in Partisan Review), and John Berryman (in a subsequent piece in the Times Book Review) followed up with abundant praise soon afterward. There were some who greatly disliked the book (Anthony West in The New Yorker, Milton Crane in the Chicago Tribune), others whose reactions were mixed (Orville Prescott in the daily New York Times, Norman Podhoretz in Commentary, the unnamed drones at Time and Newsweek). But no one interested in books ignored The Adventures of Augie March. Its freewheeling language and design, too, set Augie and Bellow off from Gatsby and Fitzgerald. Gatsby, steeped in modernist pessimism, is an exquisitely compact tale of the American dream gone sour; Augie March is a sprawling, defiantly optimistic picaresque. Yet Bellow, with his strange new mix of erudition and big-city colloquialism, was no less a stylist than Fitzgerald or Hemingway. James might have been more comfortable in the Humboldt Park neighborhood on Chicago’s West Side where Bellow grew up in the 1920s and ’30s, having moved there from Montreal at age nine. Certainly these sons and daughters of mostly eastern European Jewish immigrants had no trouble speaking and writing recognizable English. Two of young Bellow’s best buddies at Tuley High School were the future literary critic Isaac Rosenfeld and the future Chicago newspaper columnist Sydney J. Harris. Then again, Humboldt Park was hardly a place of Jamesian gentility. It was here that Bellow picked up the street smarts he passed on to Augie, and here that he met embryonic versions of several of the many memorable characters peopling Augie’s story. William Einhorn, the crippled eccentric who occasionally acts as a surrogate parent to the fatherless Augie, was, according to the Atlas biography, modeled on a local real estate king, the father of Bellow’s Tuley High classmate Sam Freifeld. Grandma Lausch, the domineering boarder from Odessa who actually runs the March household, was based on a West Augusta Street neighbor of Bellow’s. And Augie himself, says Atlas, was a composite of the brothers who lived with her, Charlie and Morris August, with a strong dose of the author himself mixed in. Bellow no more wanted to stick around Humboldt Park or chase conventional bourgeois respectability than Augie did. He followed Rosenfeld and Harris to the University of Chicago, but found the atmosphere there as stifling as he would later find the strict formalism of Henry James. So he transferred to Northwestern, where he graduated with honors in sociology and anthropology. He then put in a semester as a graduate student at the University of Wisconsin in Madison, but quit to move back to Hyde Park, marry, and become a writer. The next decade was a lean one. Bellow taught part-time at a downtown teachers’ college, wrote for the Federal Writers’ Project and a Great Books guide published by Encyclopedia Britannica, and traveled in Mexico on money inherited from his mother. He was also writing short stories and novels. An apprentice novel was bought for $150, then incinerated by Bellow after the tiny publishing house that purchased it was put out of business by World War II. His first published novel, Dangling Man, came out a year before Bellow finally became fed up with three years of his own dangling by the U.S. military authorities and signed up for service in the merchant marine in April 1945 (after the Japanese surrender, Bellow was released to inactive status in September 1945). By the time The Adventures of Augie March was published, Bellow had moved on to Bard College, a small, arty liberal arts school on the east bank of the Hudson River about two hours north of Manhattan. He had recently turned 38. Keith Botsford, who besides teaching a course at Boston University with Bellow (An Idiosyncratic Survey of Modern Literature) has coedited a series of literary magazines with him over the years, met his future collaborator at Bard the very evening of the book’s release. Botsford had queued up at Bloomingdale’s at nine o’clock that morning to buy a copy, he recalls, and read it on the train up from Manhattan. That night, Chanler Chapman (the inspiration for Bellow’s protagonist in Henderson the Rain King) held a party for new Bard faculty at his Barrytown estate. Botsford (himself immortalized as Pierre Thaxter in Humboldt’s Gift) found Bellow in a corner being monopolized by Jack Ludwig (the future Valentine Gersbach, cuckcolder of Moses Herzog). Botsford elbowed Ludwig aside, told Bellow how much he liked his new book, and a 50-year friendship was born. As the tale of his adventures ends, Augie has fetched up in Paris, married to an actress he had met in Mexico and working as an overseas representative of his cynical Armenian lawyer friend Mintouchian. Like Bellow, Augie spent several weeks in Rome, smoking cigars and drinking coffee to contend with the summer heat. Because his traveling alone for his job left him with a lot of time on his hands, he began writing his memoirs — which Bellow’s readers supposedly held in their hands. If Augie’s fictional memoir would have seemed rude or unwieldy to Henry James or Hemingway, then, so be it. 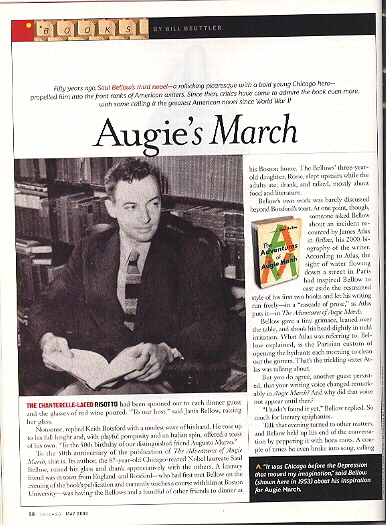 “In the great period of the novel,” Bellow explained to the Times Book Review as The Adventures of Augie March was first being published, “the novelist didn’t care — there was a great mass of sand and gravel; there was diversity of scene, a large number of characters.